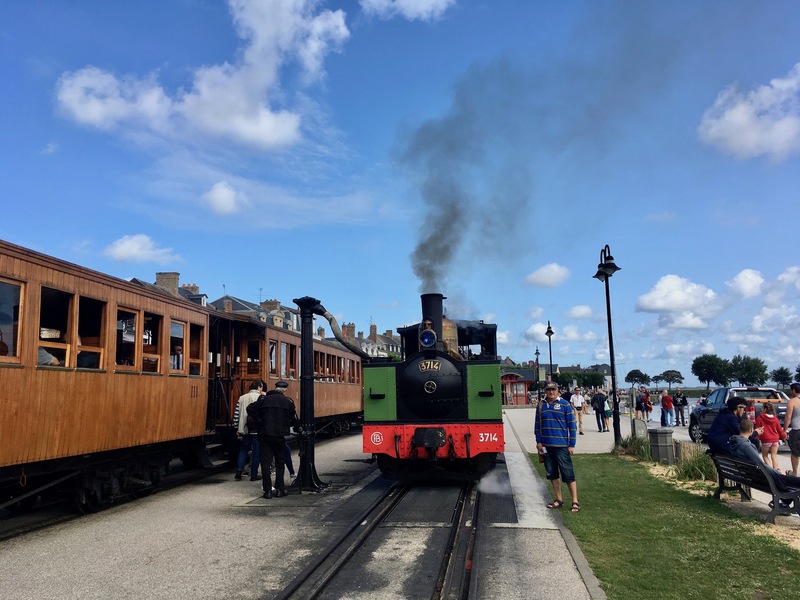 So, mid-morning, we walked into town to catch the steam train that makes the trip around the bay to Le Crotoy. 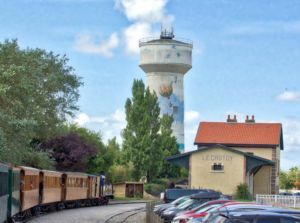 The Somme Bay Railway is one of the premier tourist attractions in the area but also has a fascinating history. 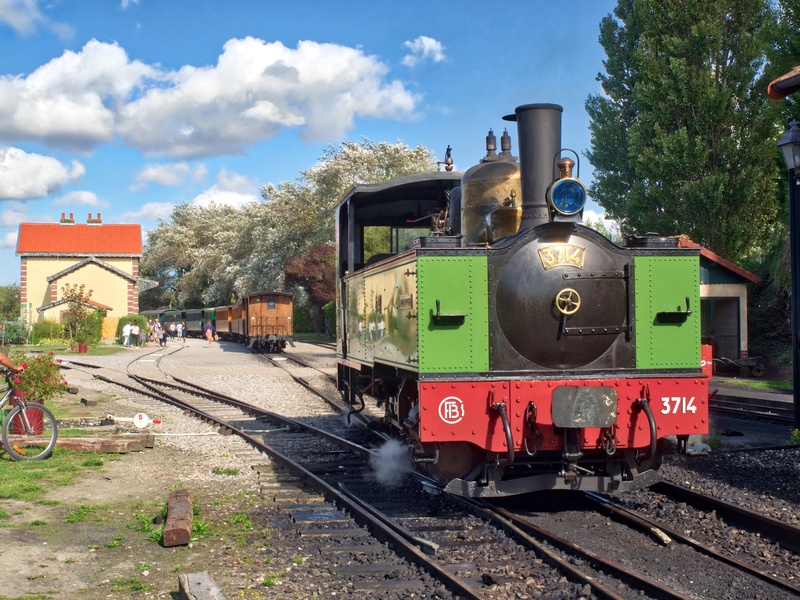 Begun in 1853 and first used in 1858 the railway initially ran between Noyelles and St Valery. In 1887 a narrower gauge line was opened from Noyelles to Le Crotoy and added to St Valery and extended to Cayeux. It is that ‘metre gauge’ line that is used today. The system operated to carry freight (sugar beet, seafood, pebbles) and passengers until declining traffic led to progressive closures ending in 1993 with the last commercial traffic run by the government railway system. 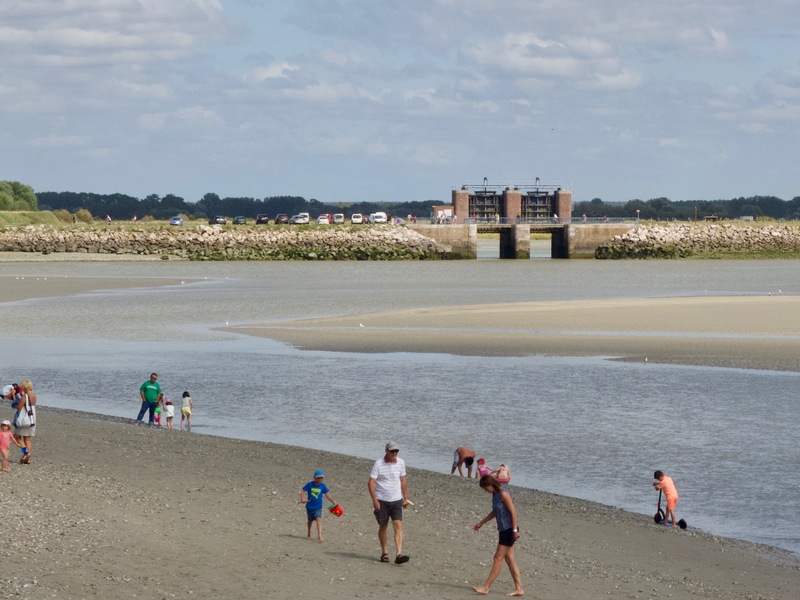 Fortunately, in 1970, the Chemin de Fer de la Baie de Somme (CFBS) was formed by locals and railway enthusiasts with the aim of preserving the metre gauge route from St Valery to Le Crotoy for tourist traffic. 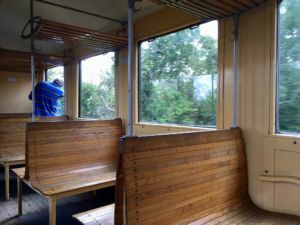 Over time, they have taken over the entire line and it runs as a volunteer-staffed but fully-funded operation based on the carriage of tourists over the entire year but with a full schedule from April to September. In 2013 the system carried 165,000 people. 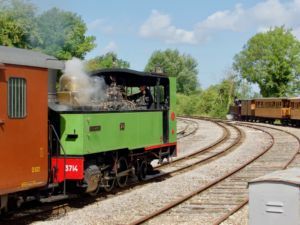 They use steam trains on the St Valery to Le Crotoy route and diesel engines on the St Valery to Cayeux trip. The full details, history, fares and timetable are described at the organisation’s website (in English). 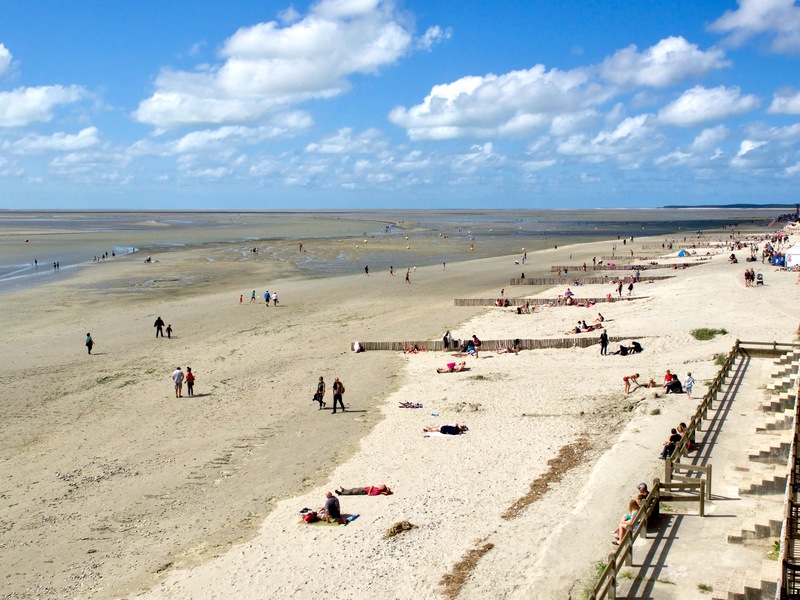 The journey around the bay takes about an hour, with a single stop at the half-way point, Noyelles. At this point, the engine is unhooked and moved to the other end of a second train, which had left from Le Crotoy and met us at this midpoint. The engine from that train was then hooked up to our carriages. Once both trains had their engines attached, we were delighted to find we were taking part in a race. 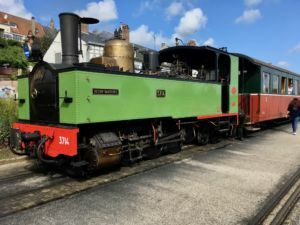 Each of the two trains increased its speed, as the tracks ran in parallel for a few hundred metres until separating with one line continuing on towards Le Crotoy and the other returning to Saint Valery. Plainly this is part of the attraction amidst loads of cheering, clapping and victorious toots from each of the engines. Taking on water at St Valery. The scenery along the trip is nothing special, just low marshy land and huts dotted here and there for the duck shooters who spend the night holed up, weapons at the ready. 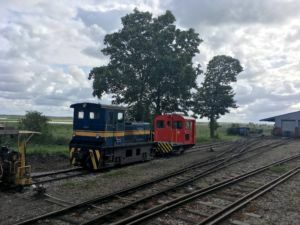 The flat landscape was not a problem for Ian who spent the entire journey hanging out the window anyway (which he invariably does on a steam train) more interested in catching glimpses of the locomotive and collecting coal grit in his hair from the smokestack. 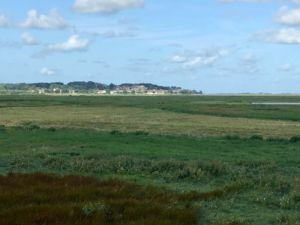 However, you can see both St Valery and (Le Crotoy) in the distance as you travel around the bay and back. Interestingly for us Aussies the sheep we saw grazing here and there are specially bred to feed on the saltbush in the estuary and their salt marsh lamb meat is prized for its rich taste, indeed the meat from this region has its own AOC certification. In Australia, saltbush lamb is also highly regarded and difficult to find. 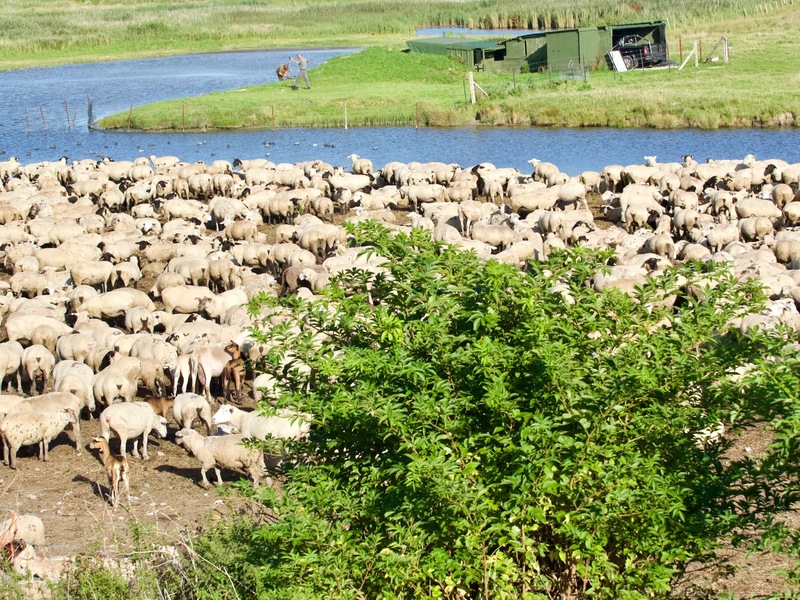 Working the sheep is hard as it involves ensuring they are herded to avoid the tides and their feet much be constantly attended to, to prevent them getting infections from the softening by contact with the water. Still, with the high prices the meat commands, and the large herds, it seems to be a profitable exercise. 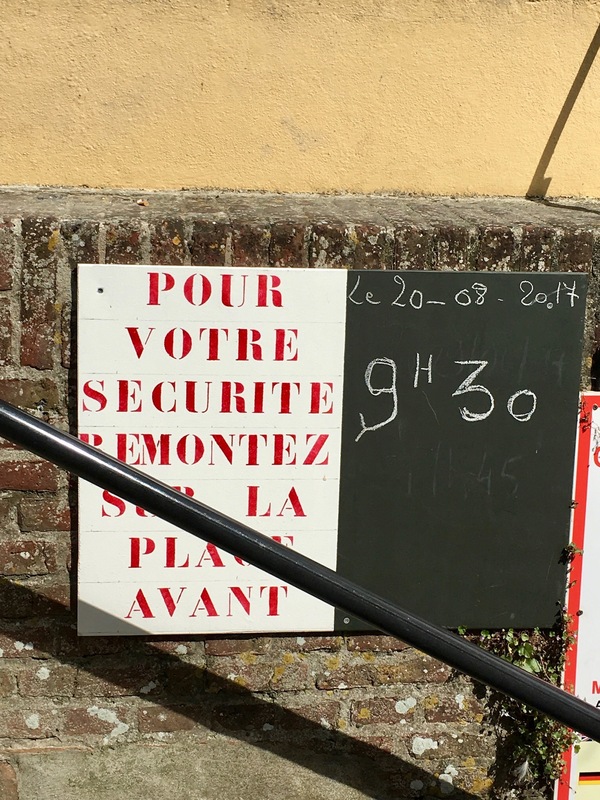 By late morning we disembarked at the little station in Le Crotoy, with the sun shining, and a gentle breeze keeping the temperature down. 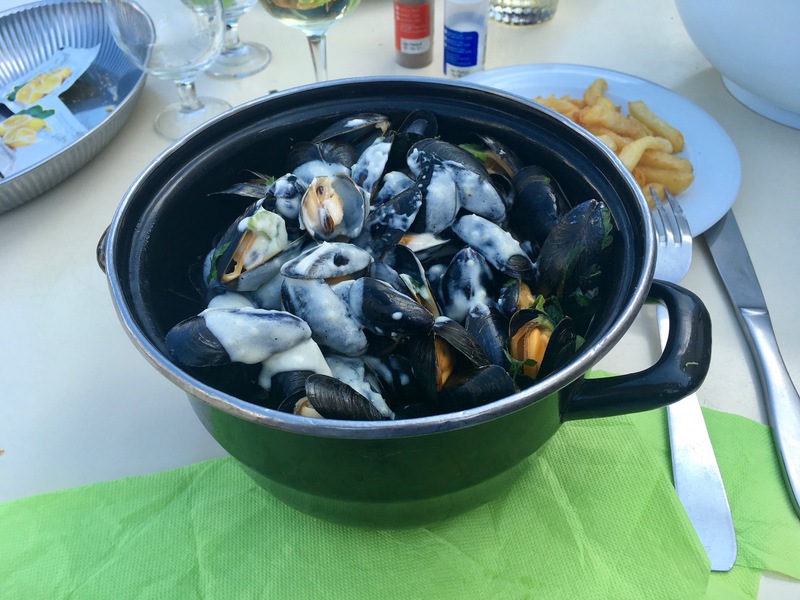 We strolled into town past a marina that was busy with boats of many different shapes and sizes and had lunch, moules (mussels) and frites, at one of the many restaurants that line the shore. 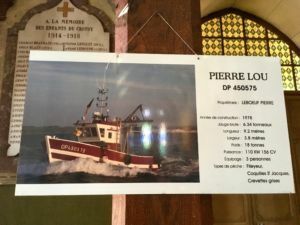 Le Crotoy used to be a thriving fishing village and this is still evident in the stalls that are dotted between the restaurants, with an amazing display of fresh fish and shellfish. Then it was time to explore so we took a stroll in the warm sun to work off our lunch. Almost hidden down a quiet street we came across St Peter’s Church with the distinctive rectangular tower characteristic of early Middle Age churches. 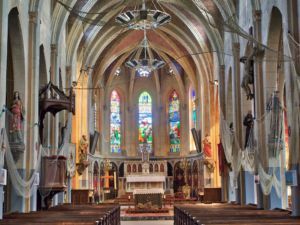 Inside was revealed a strong bond with the town’s fishing history. 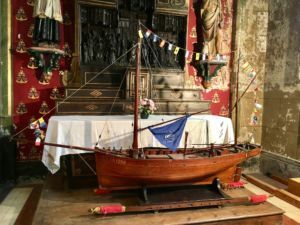 The interior of the church was festooned with fishing nets and wooden models of boats hanging from the ribs of the roof. 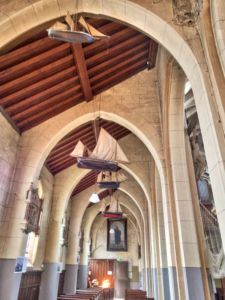 And decorating each of the pillars were photographs of local fishing boats. 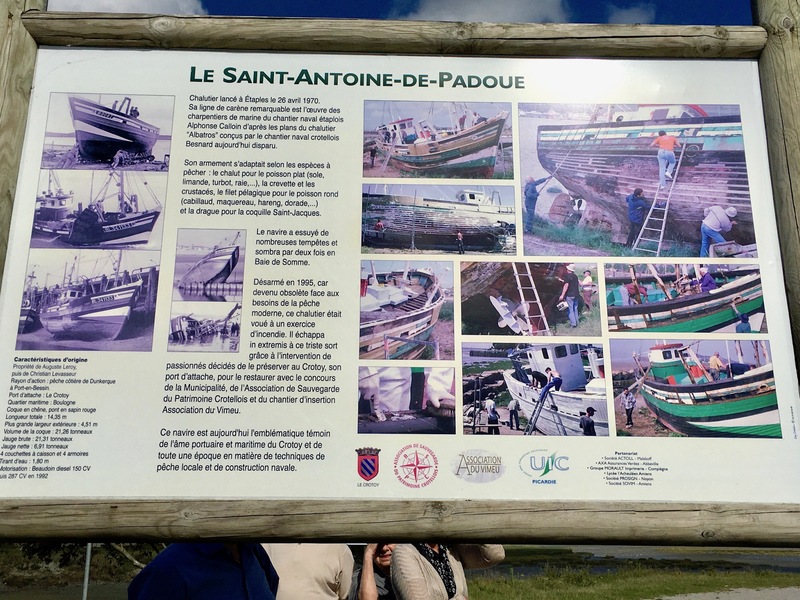 Each picture carried the name of the boat, the skipper and crew and the type of fish they caught. 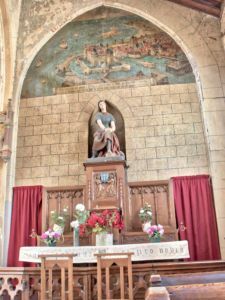 The close bond between the life of the town and religion felt really special. 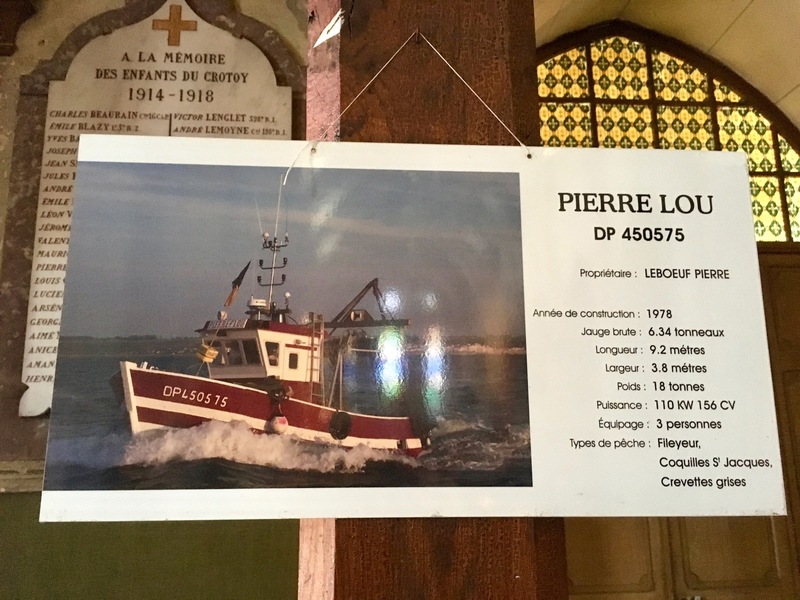 One of the current fleet of fishing vessels at Le Crotoy. 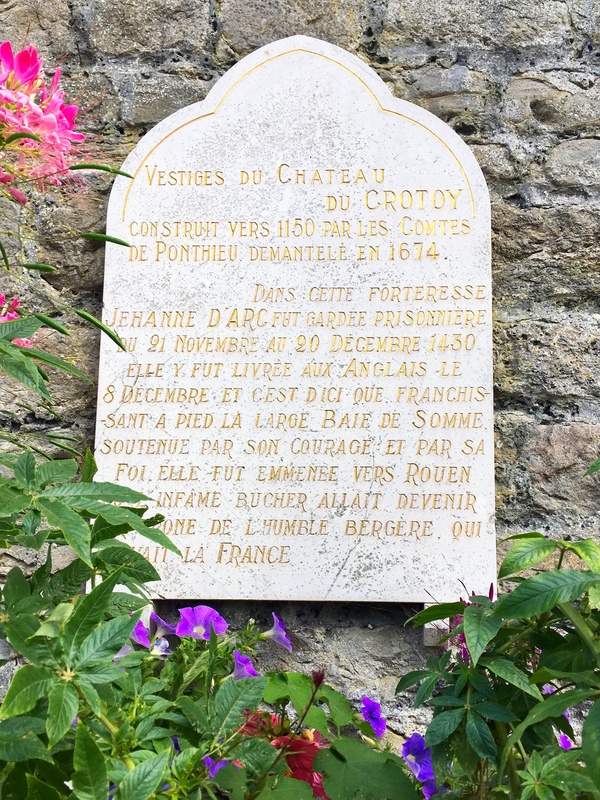 Another important aspect of the Le Crotoy is that it was here that Jeanne d’Arc was first imprisoned after being captured by the Duke of Burgundy’s forces during the siege of Compiègne in 1430. 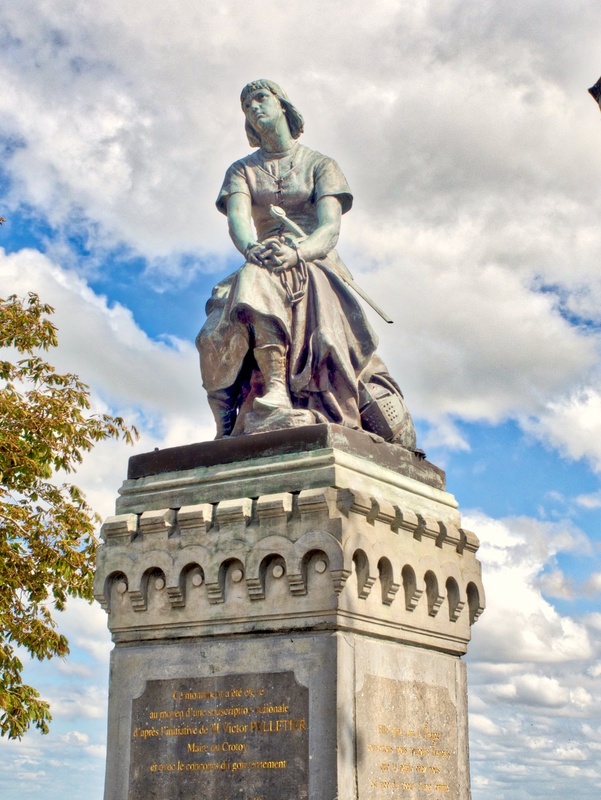 She was imprisoned in the Beaurevoir castle, where she famously tried to escape by jumping 70 feet into the muddy moat. 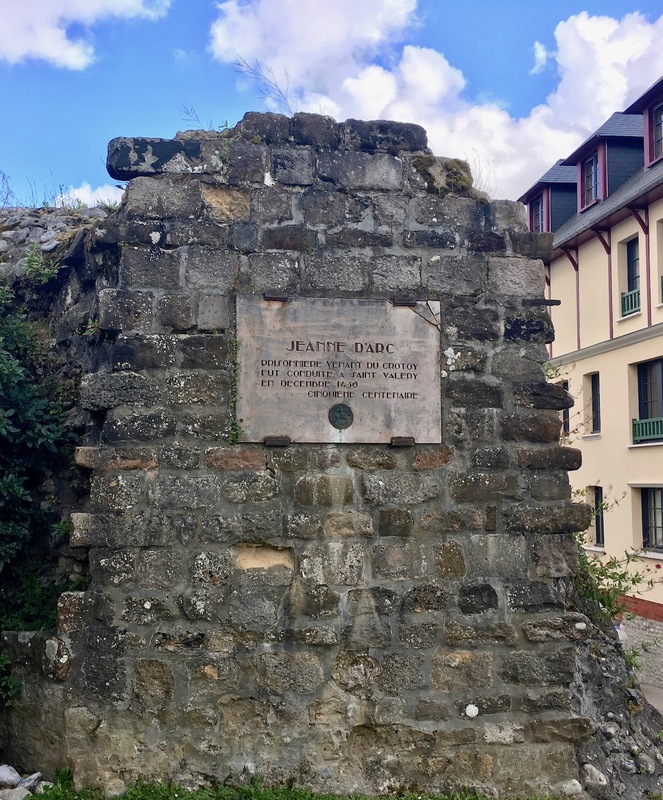 After being sold to the English she was transferred through Le Crotoy and Arras and then on to Rouen where, eventually, she was famously tried, found guilty of heresy and cross-dressing and burned at the stake in 1431. 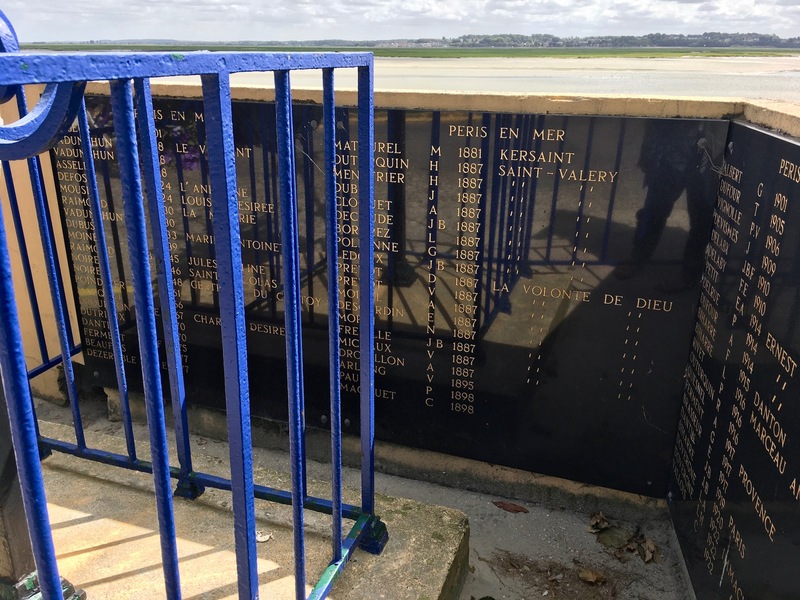 You can see plaques in St Valery and Le Crotoy noting her imprisonment. Plaque in St Valery celebrating the 500th anniversary of her imprisonment. A prisoner from 21 November to the 20 December 1430. Delivered to the English on 8th December and then taken to Rouen. and there is a large statue honouring their warrior saint on the beachfront in Le Crotoy. Our wandering gradually led us back to the shore of the bay, where holiday-makers were making the most of the beach while the tide was still out. We saw more memorials to lost sailors which, sadly, had quite recent entries attesting to the still current dangers of fishing in the North Sea. Alongside were chalkboards with the day’s high tide times posted and signs reminding visitors to refrain from walking across the bay too close to high tide. 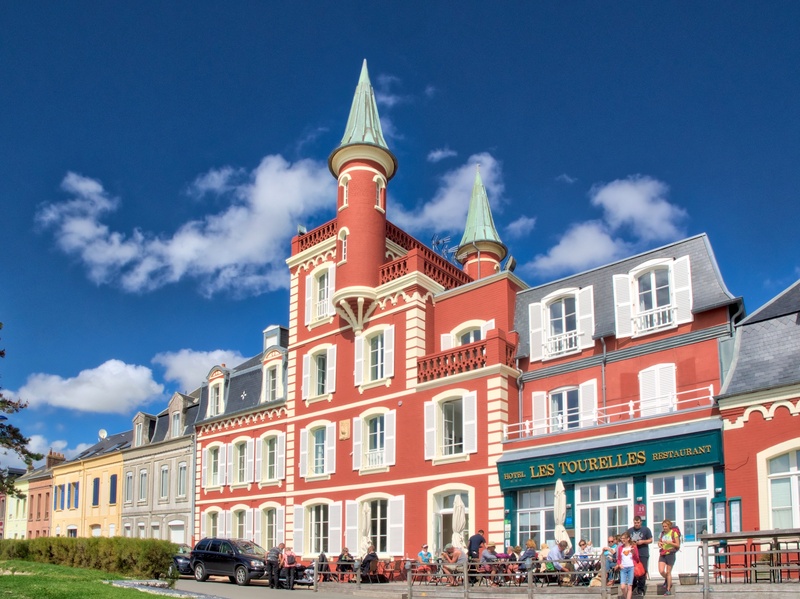 The houses, well almost mansions, along the beach front were colourful and dominated by Les Tourelles hotel and restaurant. 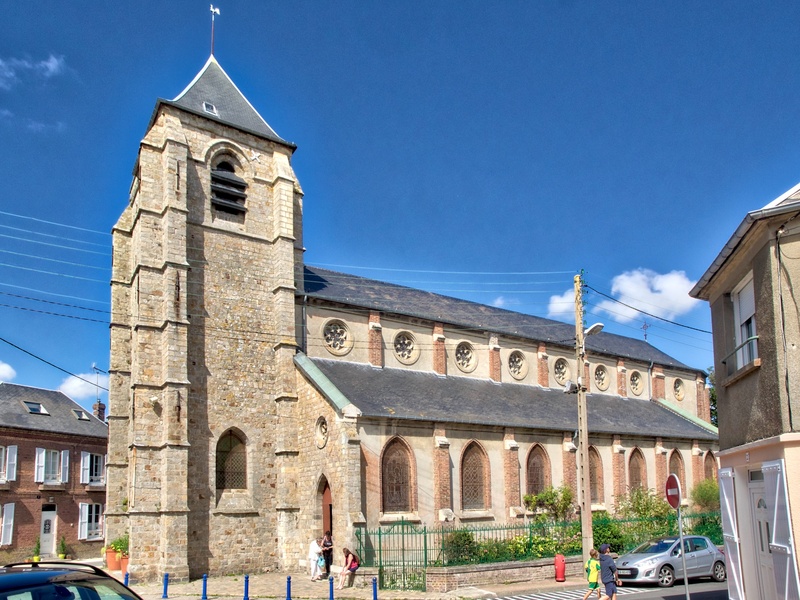 It was found, derelict, by a group of Belgians who formed a consortium of some 40 friends and who then restored and renovated it into the spectacular building that dominates the seafront and can be easily seen from across the bay in St Valery. 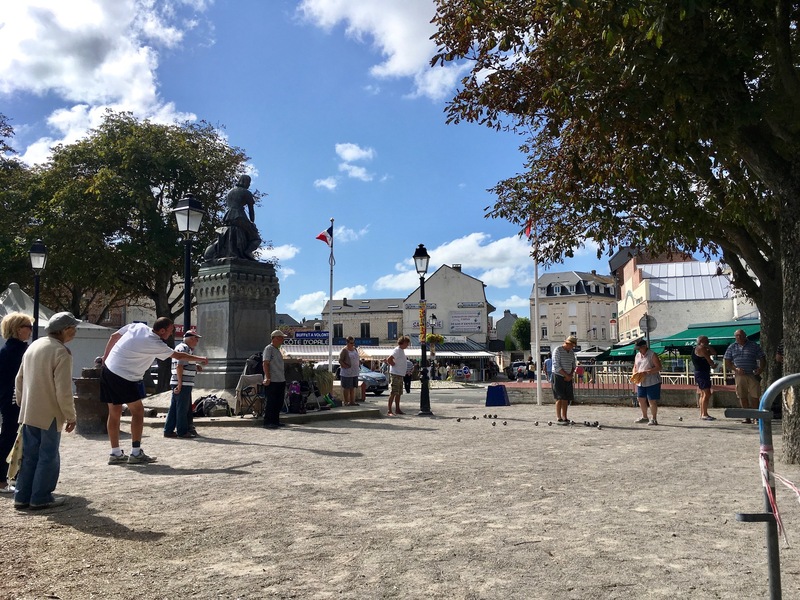 We paused amongst the holiday makers for an ice cream and watched a couple of games of Pétanque that were taking place next to the statue. Players would leave and join, seemingly at random – a handshake or kiss on the cheek to denote their departure or arrival. 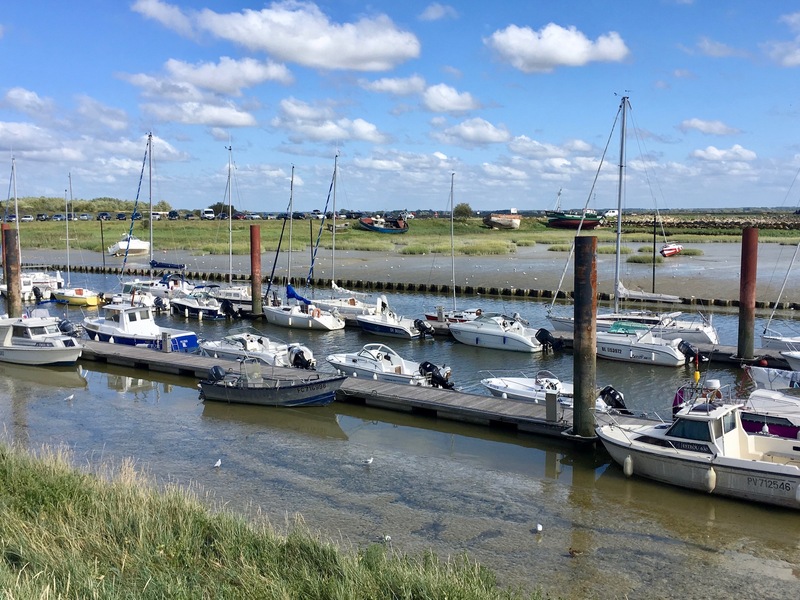 As we made our way back to the station, we found the marina now more of a mud flat, with boats resting tilted every which way on the wet sand. 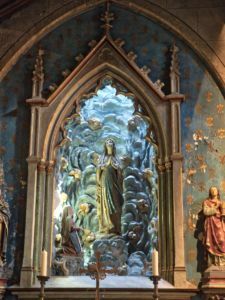 that was in the process of being painstakingly restored by a local preservation society. Further along the causeway, we could see the gates of what we were told was or is a hydro-electric scheme. Too far to go given we had a train to catch, which was a shame. On the far side of the gates is a large basin. As the tide rises, the gates allow the water to enter the basin. 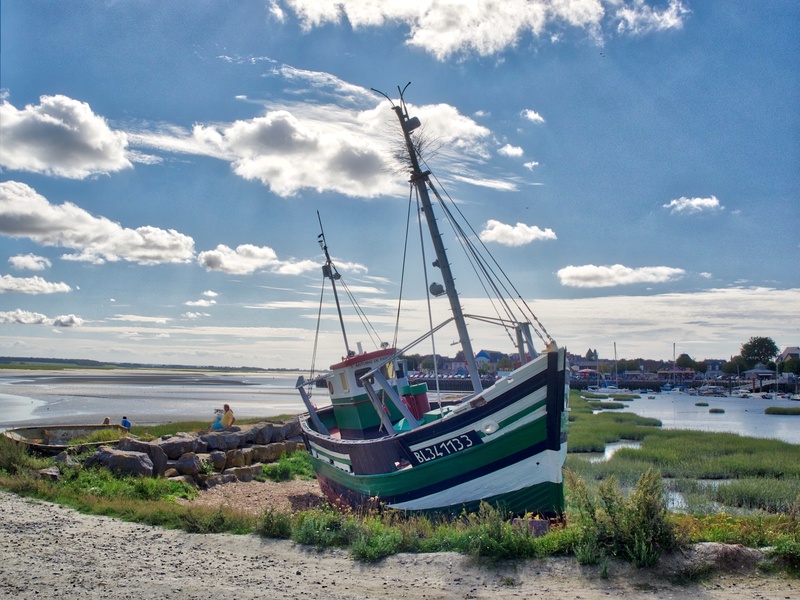 At high tide, they close automatically and remain closed until close to low tide. At that point, they could be used for hydroelectric power. 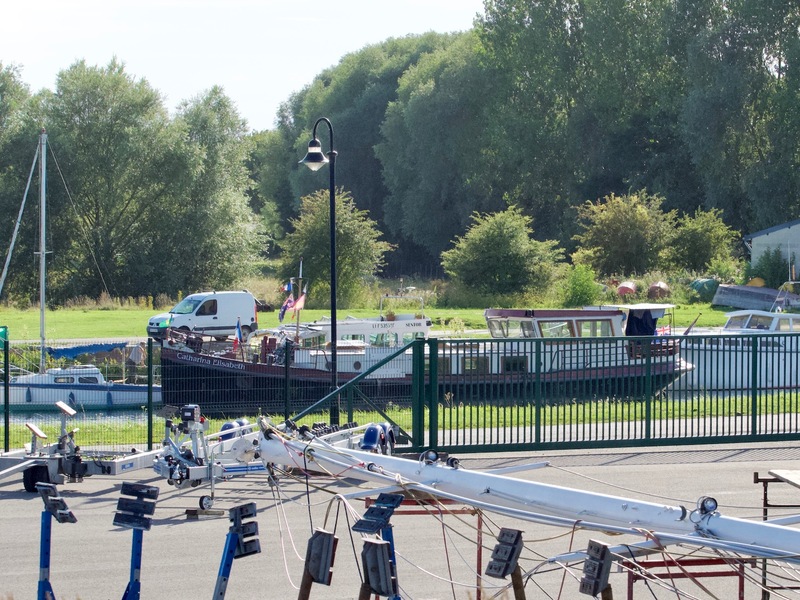 It seems however that the main use is to allow a power flush of water to race down and help keep the port of Le Crotoy free of silt. 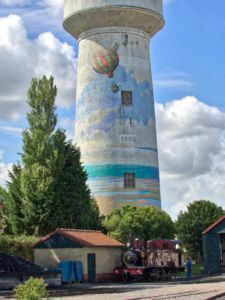 the peace and quiet of the late afternoon was disturbed by a loudhailer on a van that was lapping the town continuously proclaiming that circus was in town. Only in a language other than English would this seem quite so intriguing. We were regaled with the promise of “les juggleurs” and “nombre des surprises”: and a “selection des meilleux (best)”…, along with “les animaux sauvages“. It all sounded very intriguing – but we still had to catch the last train home. Eventually, we arrived back in time to see them preparing to attach the engine back to the carriages. Lisette found a seat and chatted in French to the couple opposite while wondering if Ian would make it on board on time, distracted as he was by snapping photos furiously as the engine prepared to join the carriages. 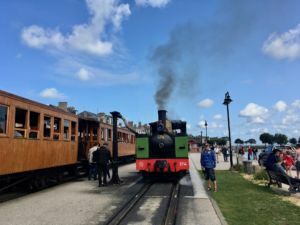 During the journey back to Saint Valery, we were entertained once again with the steam train race, and had sights along the way pointed out by the French couple. Here we learnt more about the passion for duck shooting. We could now see that low mounds we had noticed rising from the marshy ground were, in fact, duck blinds with small slits cut into them for the hunters to do their thing. The hunters arrive before sundown and must cease at dawn. As we approached Saint Valery once more we were treated to a view of Catharina Elisabeth safely moored up against her cruiser pal. We spent the next day, which was cold and rainy, inside – catching up on blogs and chores. The only significant event during the day was that the Angry Frenchman left with the morning convoy, heading towards Abbeville. 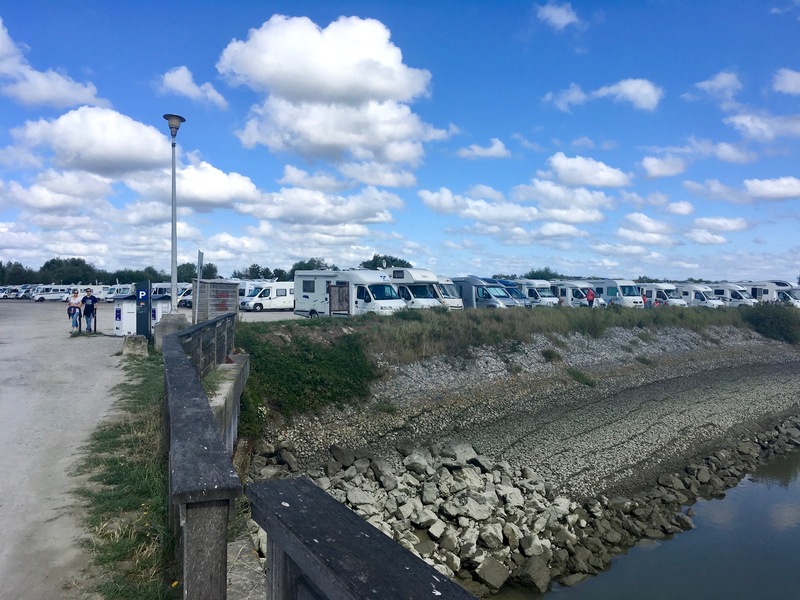 Next morning, we would also be leaving Saint-Valery-sur-Somme, after thoroughly enjoying our stay in this pretty coastal town.